What is a nutraceutical (dietary supplement)? How do nutraceuticals and dietary supplements work? When should I consider taking nutraceuticals? How do we know that nutraceuticals work? What are the right nutraceutical supplements for me to take? Welcome to T.L.C. Physical Therapy's resource on the use of dietary supplements. Nutraceutical is a new word, invented by Dr. Stephen DeFelice in 1989. It is two words put together: nutritional and pharmaceutical. Nutraceuticals are dietary supplements that are also called functional foods. According to the U.S. Food and Drug Administration (FDA), a nutraceutical is any substance that is a food or a part of a food that has medical or health benefits. Nutraceuticals help prevent and treat disease. These products can be single nutrients like Vitamin C. Or they can be dietary supplements such as a multiple vitamin/mineral combined together. A nutraceutical can also be a genetically engineered designer food. You can get nutraceuticals from herbal products. Nutraceuticals come in processed foods like cereals with iron added. Even sports drinks with electrolytes have nutraceuticals in them. The definition of nutraceutical also includes special diets. One example is a diet used to treat chronic inflammation. Nutraceuticals are most often thought of as a chemical product taken from foods. They have been shown to have health benefits. They also provide protection against chronic disease. There are some nutraceuticals other than vitamins and minerals that are good for spine and joint problems. These include glucosamine sulfate, chondroitin sulfate, fish oils, and the herb Boswellia. The U.S. Congress defined the term dietary supplement in 1994. Itï¿½s part of the Dietary Supplement Health and Education Act (DSHEA). It says that a dietary supplement is a product taken by mouth that contains any chemical ingredient meant to add to what a person gets in their usual diet. The dietary ingredients in these products may include: vitamins, minerals, and herbs or other plant materials. They also include amino acids and substances such as enzymes or organ tissues. Dietary supplements can be extracts or concentrates. They may be found in many forms such as tablets, capsules, soft gels, gel caps, liquids, or powders. They can also be in other forms, such as a snack bar. If they are offered as a snack food, then information on the label must say the product is not food and not the only item of a meal or diet. Supplemental nutraceuticals work by giving you extra nutrition. Whenever your diet is not able to meet all the nutrients needed by your body, supplemental nutrients may be helpful. Illness, injury, or extra hard work can increase the amount of nutrients your body needs. Nutrients are the chemical elements that make up a food. Nutrients are the basic elements of what you eat that give your body what is needed for running the show. That process is what we call metabolism. Certain nutrients such as carbohydrates, fats, and proteins give us energy. 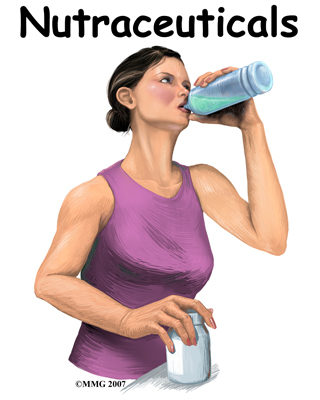 Other nutrients like water, electrolytes, minerals, and vitamins are needed for healthy metabolism. Metabolism is the work your body does to change the food you eat into the tissues and organs of your body. Metabolic processes help the body make hormones and other chemical messengers. These products of metabolism signal your organs to work properly. Metabolism also refers to the way your cells change the chemical energy in nutrients into mechanical energy or heat. Metabolism is the work of the cells, fluids, tissues, and organs of your body. You can think of nutrients and metabolism as a kind of bucket brigade. You have a health problem. For this example, we'll say it's like having a house on fire. The goal is to put out the fire (heal the health problem). You have a line of people, passing buckets of water to toss on the fire. These are like the nutrients that do the work of metabolism. If there are not enough people in the line to stretch between the water source and the fire, then the process will not be complete. In our example, this means the fire will burn up the house. What if you have some, but not quite enough of the proper elements of nutrition? You may not heal a wound, or repair an injury as well or as soon as you could. If you had all the nutrients you needed for the job, then wound healing and tissue repair would go faster. Good health and proper function requires a good diet. It must contain all the elements of metabolism needed to do the job. A person who is climbing a mountain will need to metabolize more than a person sitting at a desk all day. A person who is healing from surgery needs extra nutrition to meet the demands of tissue repair. Nutraceuticals are prescribed because a healthy diet is hard to find. Many people like to think that they eat a healthy diet. They think they have everything their bodies need for good health. Studies have shown that many people can describe a healthy diet. But when they write down what they actually eat, it's not a nutritionally complete diet. Other studies have shown that the standard American diet has more than enough calories. But the food does not have the right amounts of vitamins and minerals. It doesn't have enough fiber, carbohydrate, or protein. All of these things are needed to really be healthy. Supplemental nutrition is needed because most people do not eat an ideal diet. Over time, your body will begin to show the effects of a less-than-perfect diet. Feeling tired or having colds too often are some of the signals of nutritional deficiencies in your body tissues. Regular joint stiffness and body aches can also be signs of decreased nutritional health. When you are faced with extra challenges like injury or surgery, nutraceuticals are a quick and reliable way to flood your system with chemical elements. For a short time, you will get all you need to restore, repair, and return to excellent health. You should use nutraceuticals when your diet does not give you all the nutrition needed for your situation. Different life events need varied nutritional support. For example, most people know that a pregnant woman needs to eat more. She needs to eat a special diet because she is in a special situation. Pregnancy is a state that requires better nutrition for a better outcome. We know that if a woman does not have enough folic acid, she is much more likely to have a baby with certain birth defects. Too much of something can be as bad as not enough. A woman who eats too much sugar when she is pregnant can develop a kind of diabetes that will also make her baby sick at birth. This is called gestational diabetes. It increases the child's risk of being overweight. The child is also at greater risk of diabetes as an adult. In the same way, many other situations require better nutrition for a better end result. If you are injured, you need more nutrition to give your body the raw materials it needs to rebuild your damaged tissues. If you are sick with an infection, you need extra dietary chemistry to help your immune system. Good nutrition helps the immune system fight the virus or bacteria that is making you sick. And if you are having an operation, you will have an injury that needs to be repaired. Inflammation is part of chronic conditions like arthritis and degenerative disc disease. The inflammatory process can result in destructive, painful diseases. Inflammation is caused in part by poor nutrition. Correcting your nutritional intake can relieve it. Osteoporosis is a condition in which bone is weakened because of nutritional deficiency. Taking supplemental minerals and vitamins can help improve the strength of brittle bones. Once a disease is started, it is very hard for most people to eat enough of the right foods and to digest them properly to help. It takes a special effort to get the extra nutrition needed to get over an illness. Dietary supplements are used like medicine in this case. They are used to get the needed doses of nutrition in the right amounts required for healing damaged tissue. Surgery requires good nutrition for the best possible recovery. In a hospital there are many extra challenges to the immune system. There are unusual bacteria and viruses your body must protect itself from. There is the stress of being away from home. Having pain and surgical wounds to heal are also stressors. Spine surgery requires a lot of blood building. Your nutrition is the source of all the chemistry you need to make new red blood cells. You will have an excited immune system with a lot of work to do to protect you and help you recover. You will need an extra supply of nutritional elements to help you replace the blood you lost during surgery. At this point, there have been years of research on this topic. Medical researchers have published many thousands of articles. They tell us how individual nutrients and herbal medicines work in the bodies of animals and humans. This research is carried out in the same way that drugs are studied. There are strengths and weaknesses in using this method to figure out how any substance will work in the human body. We can study how a single chemical will affect a human cell. That information helps us make a reasonable decision about whether it will be useful for that cell's function or not. We can also study how having too much or not enough of a certain substance affects large groups of people. This includes vitamins or minerals or a certain dietary item like fat. We know that groups of people who do not have enough of the mineral selenium in their diet get sick more often with everything from infections to cancer. These studies do not tell us if a particular person is sick because they do not have enough selenium. The study only suggests that if that person is part of the group of people studied, there is a good chance they are low in selenium. This puts them at risk of being sick more often. Common sense tells us that selenium is an important nutrient for protection against disease for all people. Studies have shown that many people in the U.S. do not get enough Vitamin D. More than 90 per cent of people with chronic muscular or skeletal pain, limb pain, and low-back pain are lacking in Vitamin D. Research makes it clear that taking supplements with vitamin D will reduce inflammation. It will also safely treat musculoskeletal pain for many people. In the same way, research has shown that people with the brittle weak bones of osteoporosis can be helped by supplements. These are used to rebuild and restore the strength of their bones. Minerals and vitamins containing calcium, magnesium, Vitamin D, and L-lysine are used. Glucosamine sulfate and chondroitin sulfate are two more nutritional elements. They can be used to build connective tissue like the cartilage that cushions your joints. Studies have shown positive results for people with osteoarthritis of the hands, hips, knees, jaw, and lower back. They get relief from painful symptoms when they take regular doses of chondroitin and glucosamine sulfate. No drug or herb is a single, simple chemical item. And no single item, like Vitamin E for instance, can be swallowed by two different people and be digested and absorbed in exactly the same way. There is actually no way we can know exactly what a single chemical, drug, vitamin, mineral, or herb is going to do in any one person's body. It all depends on how a person digests things. How well their liver and kidneys work makes a difference. And they must have all the other chemical elements that the pill they are taking needs in order to work once inside the body. Research has given medical specialists a general idea about what amounts of different nutrients will be helpful to most people. It makes sense to take recommended amounts of nutraceuticals. This is especially true in situations where you know you will need to fight infection or heal a wound. In fact nutraceuticals can help your body face any extra stress on your system. Eating healthyand adding nutraceuticals will make sure you have all the raw materials you need. This combination will help you repair everyday wear and tear. It gives your body a much better chance to deal with damage from disease, accidental injuries, or surgery. There is no one combination of nutraceuticals that is right for everyone. The best way to get the proper nutrients you need is still by eating a diet rich in a variety of unprocessed foods grown or raised naturally. When your healthy diet doesn't seem to be enough, talk to your health professional about your symptoms and he or she may recommend a suitable nutraceutical. Copyright (2015) therapists at T.L.C. All rights reserved.